Peter Santos, a senior at Northwestern University, won first place and $3,000 in the fourth annual NDConnect undergraduate research competition held at the University of Notre Dame on October 17. NDConnect is a national competition to recognize outstanding undergraduates in nanoscience and nanoengineering. 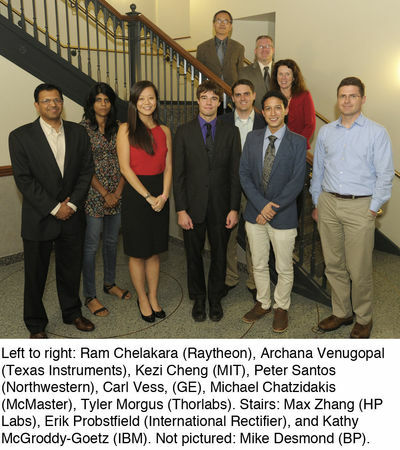 The 16 finalists (below), representing universities throughout the U.S. and Canada, were selected from applicants who submitted research proposals in the spring, then followed up with a report in August documenting their research findings. As part of the competition, the students each gave a short presentation of their research, then provided the industry judges more in-depth information in an afternoon poster session. Peter’s project, entitled “Self-assembly of a DPP tripod donor for organic photovoltaics,” focused on creating more efficient, low-cost solar cells to provide a clean source of energy (see side bar). His research was directed by Prof. Samuel Stupp. Dr. McGroddy-Goetz added that the judges’ decision was very difficult as they were “incredibly impressed” by all the students’ projects. Second place and $2,000 was awarded to Michael Chatzidakis, a senior in materials science and engineering from McMaster University. Michael’s research project, “Phase separation in immiscible bimetallic nanoparticles,” was directed by Prof. Jeffrey Hoyt and Prof. Gianluigi Botton. Kezi Cheng, a senior in materials science and engineering at Massachusetts Institute of Technology, claimed third place and a $1,000 prize. The title of her research was “Processing approaches for thin-film energy storage devices: Increase energy density of high power density graphene-based supercapacitors through C60 fullerenes.” Kezi’s adviser during her summer of research at Oxford University was Prof. Patrick Grant. Event sponsors were Thorlabs, HP Labs, IBM, Texas Instruments, Seagate, Raytheon, International Rectifier, GE Global Research, and BP.